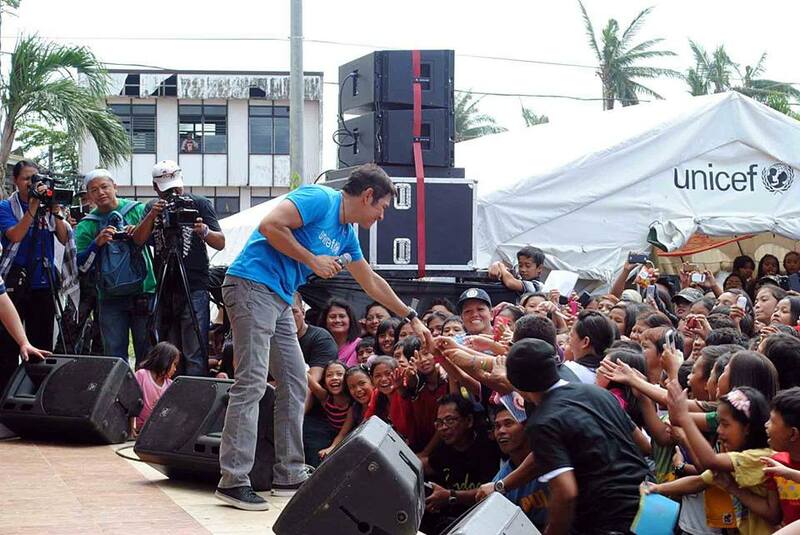 TACLOBAN CITY – Singer Gary Valenciano brought cheers to teachers and children in this city’s Rizal Elementary School who are still coping up from trauma caused by supertyphoon Yolanda. Valenciano encouraged children to come back to school as he performed songs he popularized at the Rizal Park on January 30. “I am honored to be with children who suffered the impact of the worst disaster but still managed to smile. You are not alone, Unicef has been here with you before and during the disaster and we will be here with throughout the recovery,” Valenciano told the audience. The singer, known in showbiz world as Mr. Pure Energy, is a Unicef(United Nations Children’s Fund) Philippines Goodwill ambassador for the last 16 years. “Instead of children roaming around, I encourage them to come back to school and pursue their dreams,” the singer said. Valenciano rendered some of his most popular songs “Di bale na lang”; “Gaya ng dati;” Natutulog ba ang Diyos?, I will be here;” “ Warior is a child;” “Sana Maulit Muli” and Walang Hanggan. Among those who saw the popular singer perform was Grade 5 pupil Jilian Medalla, 11, whose younger sister, Christine Faith, a Grade 2 pupil of Rizal Elementary School perished during the onslaught of the supertyphoon. “School activities and concert like this helped me recover from that traumatic experience,” said Medalla who held her younger sister before big waves hit and damaged their house. The school, one of the biggest in Tacloban, had an enrolment of 2,570 before Yolanda. The catastrophe has killed at least 5 children. Since January 6, only 1,900 are back to school, 495 have transferred to other places. Zafrin Chowdhury, Unicef Philippines chief of communication said the organization to continue to address educational needs of children along Yolanda’s path. “Gary V has been one of our strongest supporters and genuinely cares for the welfare of children. This is the perfect place and time for him to inspire children. He’s a master performer and motivates children,” Chowdhury said.